Now you see it now you don’t. A picture is worth a thousand words. A thousand pictures of Saudi King Abdullah and Iran’s President Mahmoud Ahmadinejad on Google Images embracing, walking together smiling and holding hands are now not worth the paper they are written on thanks to WikiLeaks founder Julian Assange and Private First Class Bradley Manning. The political, economic and religious leaders of the world do not think that people can handle the truth and so they lie through their teeth to us all the way to the bank. Judging by the fabulous condition the world is in obviously they are right – the people must be spared from the truth at all costs and anyone breaking this rule must be hung from the highest tree. 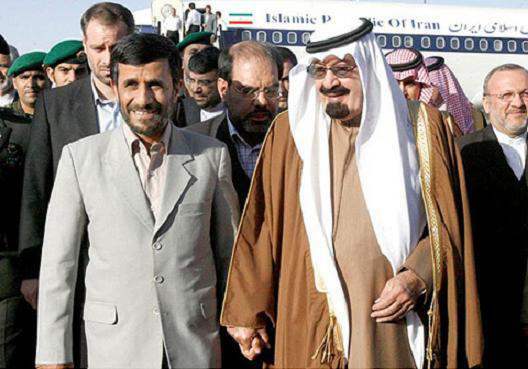 Until now the world, including Iran has thought that Saudi King Abdullah and Iran’s President Mahmoud Ahmadinejad were lovebirds. Then Pfc. Bradley Manning leaked some private diplomatic emails to Julian Assange and WikiLeaks in which Saudi King Abdullah and the leaders of the Gulf States Bahrain and the United Arab Emirates repeatedly beg President Obama to nuke and cut off the head of the snake Iran whose arms are Hezbollah in Lebanon and Hamas in Palestine. German soldiers claimed, ‘I was just following orders.’ This led to the death of 20 million people including many Germans in World War II. The Muslim countries have succeeded in presenting a united front while their people scapegoat America and Israel for all of their problems, chanting ‘Death to America’ and ‘Death to Israel’, the countries they call the ‘Great Satan’ and ‘Little Satan’. If Israel’s Prime Minister Netanyahu had nuked Tehran before now, no Jewish person in the world would have ever been safe again. Until the leaks, had President Obama nuked Tehran, the American battle for the hearts and minds of the Arab world would have been lost forever. The leaders of the Arab world would have risen as one demonizing the United States forever. Now, thanks to Pfc. Bradley Manning and WikiLeaks founder Julian Assange we know that the Arab countries are divided by the Sunni Shiite rift between Iran and Saudi Arabia and the fight between Iran and Saudi Arabia for all of the oil in the Middle East. Until now the Muslim countries have blamed the Israel Palestinian conflict for all of their problems. According to the Muslim countries once the 6 million Jewish people in Israel are exterminated all of the problems of the world will be solved. Iran’s foreign minister Manny Mottaki is close to Iran’s Supreme Leader Ayatollah Khamenei. Nostradamus’ third Antichrist Ayatollah Mesbah (Mabus) Yazdi is the hardline daily mentor of Iran’s President Mahmoud Ahmadinejad. Now that the world knows that Iran’s foreign policy has been a disaster even among its own Muslim neighbors, causing steep price rises inside Iran thanks to the UN sanctions, foreign minister Manny Mottaki had to go, the public scapegoat. Today Mabus told Ahmadinejad to fire Mottaki the Supreme Leader’s pal and replace him with a man more loyal to Mabus and his wet dreams of a World Islamic Theocracy. All the while Western leaders have called for the heads of truth tellers Pfc. Bradley Manning and WikiLeaks founder Julian Assange. Since lies haven’t been working too well perhaps we should give the truth a chance. The truth has looked good coming out of the gate. Today Iran’s new foreign minister revealed that Iran is really planning to blow up their new nuclear reactor and create a theme park on the site like Ukraine did today in Chernobyl.